Fast-forward fifteen years, and I had developed some skill as a woodworker, enough to actually be making furniture at the behest of various friends and acquaintances. I enjoyed the challenge of a commissioned work, especially when it was done with the understanding that as a hobby woodworker, I would be taking my time and not charging too much. This suited almost everyone. However, a few months after I began taking work for hire, a friend asked if I could make a custom wine rack for an odd space under a stairway. After investigating the area and taking measurements, I agreed that it could be done, and that it would take “a month or two”. She asked if 6 weeks would be acceptable, as there was a social engagement planned for the house, and the wine rack would obviously be an important part of that. “No problem.” I said. During the next few weeks, there were a number of events that conspired to put me behind schedule. I will not list them here as they have vanished from my memory, but suffice to say that I was delayed. I now had a woodworking project that I was under pressure to finish on time. This was slightly stressful, but I knew that the long Thanksgiving weekend was coming up and that I would easily finish it then. The day before Thanksgiving, I was up bright and early, and was looking forward to the last stage of building the wine rack: making a raised-panel door! For those not familiar with the process, a raised-panel door is comprised of two parts, a frame (consisting of 4 rails with slots in them) and a panel (beveled on all sides to fit in the slots). This particular door posed a challenge, in that it was not rectangular; it had one end that was pointed. Now, when one is making the slots in the rails, you just run them through a table saw and a slot is cut. Because all the rails have ends cut at a 45-degree angle, the slot isn’t visible in the finished door. Since my door had 2 odd corners though, I had to do something slightly different. The right thing to do in this circumstance is to find the angle of the odd corner and divide by two. Proper rectangles have 90-degree corners, so you make a 45-degree cut. I decided to do the wrong thing, and make ‘blind’ cuts in the rails. This is how factory cabinets are usually made. It is perfectly safe to do this in a factory. I, however, was not in a factory. I would have to make this cut by carefully lowering a rail onto a moving blade, pushing it forward a few inches, then lifting it up before the blade came out the back of the rail. “No problem.” I said. It is also worth noting that previously, I had been making projects for my own amusement. My normal pace of work was slow, and I was accustomed to my tools staying in tip-top shape for a very long time. I had noticed that the table saw was a little ‘grabby’ of late, due to the blade being a little dull. Table saw blades are expensive to replace, and it is a tedious process to properly align them as well. I would certainly have to replace the blade after the most recent project was complete, I thought. As I began my day’s work, I carefully put on my dust mask, eye protection, and hearing protection. I checked and double-checked the cuts I needed to make in the rails, and marked them with a pencil. The first two rails went smoothly, and I was certainly pleased with myself. Unfortunately, the depth of the rails had to be changed from rail two to rail three, and I neglected to do this. Alas. As I was gingerly lowering the rail onto the blade, the blade grabbed the rail and shot it across the room like a bullet from a gun. Luckily for me, I make it a point to not stand directly behind the blade when feeding work through (safety first! ), but unluckily, my left thumb and forefinger were still ahold of the rail. Briefly. When the blade flung the rail across the room, it pulled my hand after it, and I felt the blade ‘bite’. It hurt. Such events are always shocking. In my case, I clearly recall several things. First, that after fifteen safe years, I’d finally screwed up. Second, that now there would be another delay in getting this project done on time, since I would have to go in, wash the wound, put on adhesive bandages, etc… Third, it hurt! Dang it hurt! I worked up a good storm of profanity in an instant. I looked at my wounds, and saw that I would have to put a bandage on the thumb, as it was abraded rather severely. No doubt it had touched the edge of the moving saw blade. My finger looked similarly roughed up. I sighed. This was going to be a long day. Then I bent my finger and looked at the fingernail. The clinical term for what happened next is called diaphoresis. This is what happens when you’ve hurt yourself badly enough that your body is worried about you bleeding to death, so your blood pressure drops, and you break out in a cold sweat. What I had seen, when I looked at my fingernail, was a perfect little rectangular slot. The blade had penetrated about halfway down the nail, so that my index finger now resembled nothing so much as a very messy tuning fork. This, I thought, is a problem. I very calmly turned off the saw, and carefully removed my hearing protection, dust mask, and eye protection. As I walked into the house I amused myself by cupping my free hand under the damaged one, thinking, “Whoops! Don’t let the blood drip on the carpet!” Picking up the phone on the way, I stopped at the kitchen sink and rinsed my hand for a moment. Normally, this would be painful, but the pain in my finger was already at a nine-out-of-ten, so there was not much room for additional suffering. 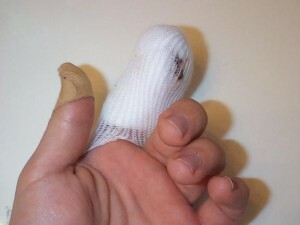 Grabbing a clean dishtowel, I wrapped my stricken finger in a snug way and compressed the wound mostly closed. I held the cut in place with my chewed-up thumb, and quietly lay down on the cool, cool floor of my kitchen. During this time, I had been pondering whom to call for assistance. An ambulance seemed excessive; the slight dizziness ruled out driving. The first person I thought of was the friend for whom I was building the wine rack. I ruled out the rather peevish response (though I thought about raising the price). The ex wife? Noo… The new girlfriend? Hmm… I didn’t know how squeamish she was. Then it hit me – my boss! I called from my position on the floor of the kitchen, and was relieved to hear her answer. A puzzled and hesitant boss responded that no, she was just sitting around reading the paper – why? “I’ll be there in 10 minutes!” she responded in earnest, and hung up the phone. I slid over to the refrigerator, pulled out a bottle of orange juice and took a drink. I then lay back down on the sweet, cool floor. How I loved that floor. Five minutes later, I realized that I was a filthy mess. Covered in sawdust, blood and dirt – that would not do! I rose reluctantly from the floor, and put on a clean shirt and hat. How curious is the mind at times like this. The boss arrived promptly, and she drove me to the nearest hospital, where the ER doctor inspected and cleaned the wound. Upon seeing the finger again, I felt the symptoms I described earlier. The doc suggested x-rays, as he felt it likely that I had gone deep enough to fracture the bone in my fingertip. “That’s why it hurts so much!” he added cheerfully. After completing some forms, and waiting briefly, I was duly x-rayed and delivered to a very cute resident, who showed me that indeed, there was still some room in my personal pain index. She administered an injection into the base of my finger that brought the pain in my hand to a perfect ten. After a very long minute, all pain faded away, and she began her happy work of sewing my finger together. I do not specifically recall if she was humming while she worked, but she was definitely happy to be dealing with a ‘real’ injury, as she called it. The x-rays did indeed show that I had sheared off the tip of the 2nd Distal Phalanx. Instead of a nice round end, it now had a distinct flatness. Antibiotics and painkillers were prescribed. After the disparate ends of my finger were sewn together, I wandered back out to the lobby for another round of paperwork, and was subsequently released. My boss, who had been patiently waiting for me during this period, asked if I was hungry. I replied that I was, but didn’t have any money. I felt quite shaken by the day, and also pathetic. When she told me she would buy me lunch, I nearly wept. We drove to a sub shop and as we ate, I felt again the powerful happiness and gratitude that comes from knowing you have friends who care for you, and who will come to your aid when you need them. The next day, using slightly better precautions (push sticks of hilarious length), I finished the cabinet. The project was only delayed a week. I have since healed fully, though the finger is a tad shorter then its twin, and a little numb. I reflected that it is a fine reminder of the need for constant vigilance in the use of tools. The need to take one’s time, the need to keep your tools in the best shape. And yes, I raised the price of the cabinet $100. Previous PostHot, Hot, HotNext PostOn Strike!